I am so excited to share a recipe on the site with tempeh, a fermented soy product that I really like and one that I have been using much more since Mr. Pamela Salzman (LOL) became WFPB (aka whole food plant-based.) Tempeh may not be as mainstream as tofu, but I think it’s actually more nutritious and I like it just as much. Tempeh is made by fermenting cooked soybeans and then pressing the mixture into firm slabs. Most of the tempeh I see in supermarkets may also contain beans, grains and seasonings. And actually, there’s a Korean vendor at my local farmers market who makes “tempah” with no soy, only beans. Tempeh holds its shape very well when it’s cooked, unlike tofu which is much more delicate. So I prefer tempeh as a substitute for ground meat, or in sandwiches and stir-fries. The flavor, however, is much nuttier than tofu which is flavorless. Tempeh does absorb flavors well, though. Like tofu, it is high in protein, low in fat and contains many vitamins and minerals. In the controversial world of soy, I think you need to use your best judgment. I limit our soy intake to no more than once per week and I opt for organic, non-GMO, sprouted or fermented soy. If you notice after eating any quantity of soy that something in your body is reacting unfavorably, such as your hormones, then soy may not be a good food for you. I do not eat processed soy products at all such as tofu hot dogs or tofu bacon, or tofutti foods. 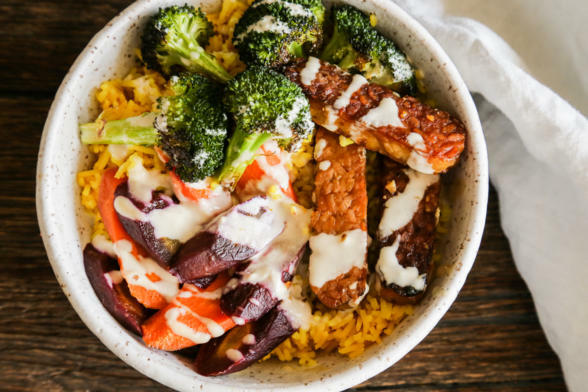 This beautiful tempeh bowl recipe hails from my friend Sonja and Alex Overhiser’s gorgeous new book, “Pretty Simple Cooking.” Friends, in as much as I can pretty much cook any recipe you give me, my first choice is to make simple food with fresh, seasonal ingredients. I could eat some version of a vegetable and grain or legume bowl every night. Give me some sautéed, roasted or grilled veggies, a tasty sauce, and protein of some sort and I am good to go. 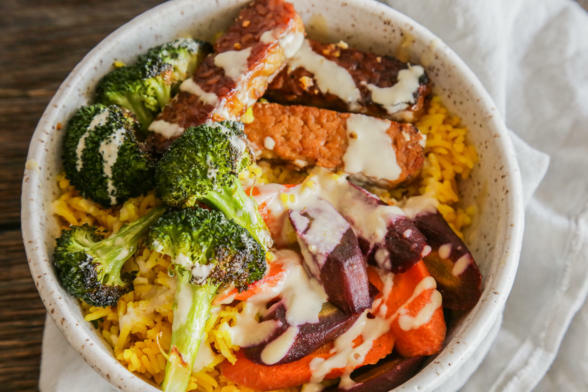 This Turmeric Rice Bowl with Lemon Tahini Drizzle was absolutely delicious and a major hit with my husband who has maybe eaten tempeh twice in his life. It was colorful, satisfying and pretty easy to put together. The only way I deviated from Sonja and Alex’s recipe was to cook the carrots with the broccoli instead of shaving them raw, and I didn’t have any kale. The soy-maple glazed tempeh is the star here, so feel free to use whatever vegetables you have and cook them however you want. “Pretty Simple Cooking” is vegetarian and has loads of recipes I can’t wait to try like homemade whole wheat naan, eggplant parmesan casserole, vegetarian lentil gyros and sparkling amethyst granita, among others. Check it out at your local bookstore or online and I’m sure you’ll see that it would make a great addition to your collection if you are looking to eat more plants, which you should be ;). As always, please tag me on Instagram @pamelasalzman #pamelasalzman if you make any of my recipes, whether they are from the blog, my cookbook, or my classes! I love seeing your creations! 1 large bunch tuscan kale or lacinato kale (about 12 ounces) - I didn't have any, so I skipped it. Make the rice: In a medium saucepan, combine 3 cups of water, rice, turmeric and salt and bring to a boil. Lower heat to a simmer, cover, and cook until rice is tender and water is absorbed, about 20 minutes. Saute the vegetables: Peel the garlic and leave it whole. Chop the broccoli into florets. Destem the kale by holding the leaf at the lowest part of the stem and pulling back to tear the leaf away from the stem, then chop the leave into roughly bite-sized pieces. In a large skillet, heat the olive oil with the garlic cloves until the garlic starts to sizzle. Add the broccoli and carrots and saute for 3 minutes. Add the kale and ¼ cup water and saute for 1 to 2 minutes, stirring, until the leaves are bright green and wilted. Add the soy sauce and sprinkle with salt, then saute another 1 to 2 minutes. Remove the vegetables from the skillet to a bowl and cover to keep warm until serving. Wipe out the skillet and discard the garlic cloves. Cook the tempeh: Peel and finely mince the garlic. Place the garlic in a small bowl with 1 Tablespoon of olive oil, soy sauce, white wine vinegar, and maple syrup. Slice the tempeh into ¼-inch-thick rectangular strips. In the same skillet, heat 2 Tablespoons olive oil over medium heat. 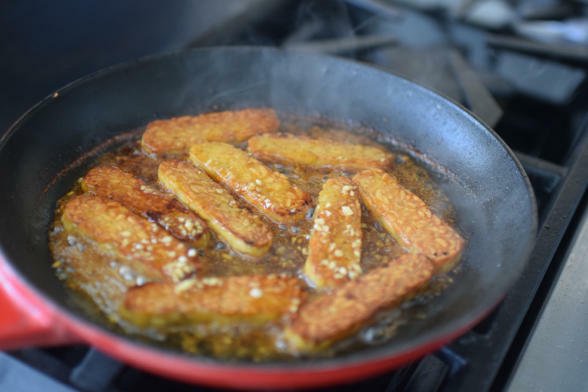 Add the tempeh slices (large rectangular side down) in a single layer and cook on one side until browned, about 3 to 5 minutes, then flip and cook for another 3 to 5 minutes until browned on the other side. Reduce the heat to medium low ad pour in the soy-maple mixture. Cook another 5 to 6 minutes until the tempeh is evenly browned and the liquid is mostly reduced, shaking the pan occasionally and flipping the tempeh once more time before the liquid is completely reduced. When browned, remove the tempeh from the heat into a bowl. To serve, place the rice in bowls, then top with broccoli, tempeh, carrot and green onion, if using. Drizzle with lemon-tahini dressing and serve. Make ahead: make the rice, tahini drizzle, and broccoli and kale in the advance. The day of serving, reheat the rice and cook the tempeh. I made this after my 14 year old daughter came home from a weekend middle school camp and said “only vegetables PLEASE!” The tahini sauce is so good and couldn’t be easier. Good rice too. I did use Gomasio and crispy kale from your Buddha Bowl recipe for toppings. What??!! Vegetables only?? Hooray for that!! !